Posted 15 October 2010 in Day Entries, Earth, Heroes, Jimmy Olsen #133, Supporting Characters. Okay, okay, this is way off the chronology as far as first-appearances here, but this scrawny kid is full of pugnacious courage and off-the-wall craziness, all in his perennial scuba gear, I gotta single him out… I just love it when Jack goes a little bonkers: I mean, how was the King thinking he could regularly use a newspaper delivery boy-slash-adventurer who always wears a wet suit, flippers, diving mask and oxygen tanks??? You’d think the lad would be a… errr… fish out of water, wouldn’t ya? Well, this sequence, taking place during the wild underwater ride on the Zoomway, is your answer, skeptics! Flip is, natch, the newest member of the New Newsboy Legion (given he wasn’t born into the group). In a follow-up ish, we find that his unnamed father (Mr. Dippa?) is coincidentally associated with the now grown-up original Newsboy Legion! I mean, what are the odds…? I still haven’t figured out if the newest Newsboy’s official name is Flipper Dipper (sometimes with a hyphen) or Flippa-Dippa (sometimes without). Me, I dig the non-parenthetical latter, dig? Posted 12 October 2010 in Bonus, Cooke Looks, Jimmy Olsen #133. 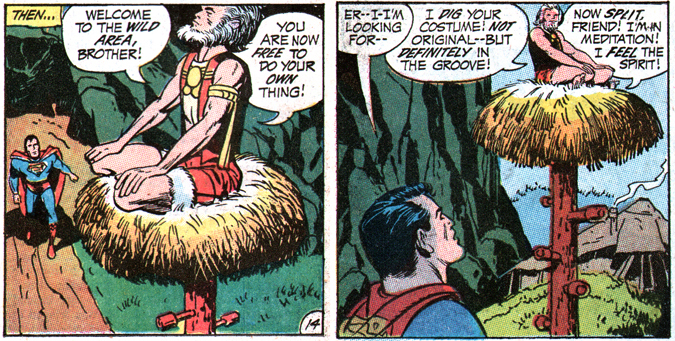 The word that might best describe Superman’s Pal, Jimmy Olsen #133 is inventive. 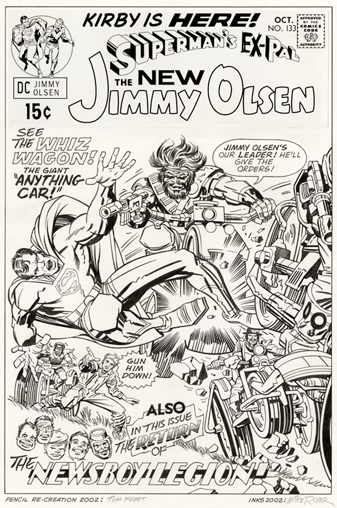 In a mere 22 pages, in his debut comic book during his 1970s tenure at DC Comics, Jack “The King” Kirby let loose his creative energies and hurled one new idea after another at our tender, unprepared noggins, and those of us who “got” it, those of us who didn’t compare this wild new material to his Marvel stuff with Stan Lee, those of us who were amused by his oft-corny interpretation of the youth culture… well, we were changed for good. Would I feel the same way if the Kirby saga in Jimmy O was a stand-alone epic and not prelude to the cosmic mythology we now call Kirby’s Fourth World? I dunno, but as I mentioned in my introductory post, I distinctly recall picking up the orange-colored “first” issue and being just floored by the sheer inventiveness, and I do believe I would hold that book in the highest regard of, at least, the entire JO run (and don’t forget: Edmund Hamilton’s superb Nightwing and Firebird saga partially took place in the pages of that title, with that luscious Curt Swan and George Klein artwork, so it ain’t all “Jimmy as giant turtle-man” kitsch…). But JO #133 was prelude to the greatest super-hero adventure of them all. (Alan Moore’s “Marvelman/Miracleman” epic might be the singular contender, though “Born Again” in Dardevil by Frank Miller and David Mazzucchelli also comes darn close, in my less-than-humble opinion.) Not only do we get the first inklings of the encroachment of Darkseid and his hordes of Apokolips, but we also get the reintroduction of a bona fide Kirby Kid Gang, The Newsboy Legion. Only now the group has left the gritty despair of Suicide Slum, and instead lives in an amazing futuristic new world of Kirby’s imagination… the best kind of nostalgia and yet not looking back. And, anyway, as we would subsequently learn, their presence would lead us to a revitalized golden avenger, a character I would grow to love. I’ll admit that I have always been mildly annoyed with the other-dimensional quality to the myths Kirby embraced and/or created. Like, for instance, just exactly where was Asgard, home to the Mighty Thor and his brethren? And where precisely is the earth-side entrance to the Rainbow Bridge? Hell, I can buy the “fact” a Norse god flies earthly skies courtesy of a hammer only he could hoist (I mean, the physics alone boggle the mind! ), or that a scrawny 4F 90-pound-weakling is injected with a serum to become a super-soldier, but I guess I yearn for some exactitude in the fantasies I love. And I’m not alluding to the exact “where” of Apokolips and New Genesis here (I’ll get to that conundrum in a post to come, you betchum! ); what I wanna know, desperately, longitude and latitude, is the location of the Wild Area, okay? It seems far from Metropolis and yet is still within thermonuclear-explosion range… Boy, ain’t I pathetic and petty! Now, back to our story: just what is this “Mountain of Judgment” Yango keeps yammering about…? Posted 12 October 2010 in Day Entries, Earth, Jimmy Olsen #133, Locations. By 1970, the environment was becoming a huge concern to average Americans (note that the first “Earth Day” was marked in that year) and there was a “Back To Nature” movement taking place within the counter-culture, with young people gathering into communes, living self-sustaining lives. Jack tapped into these issues and, I suspect, might have visited a Giant Redwood forest (having moved recently to the Left Coast), and his feverish imagination went into overdrive. 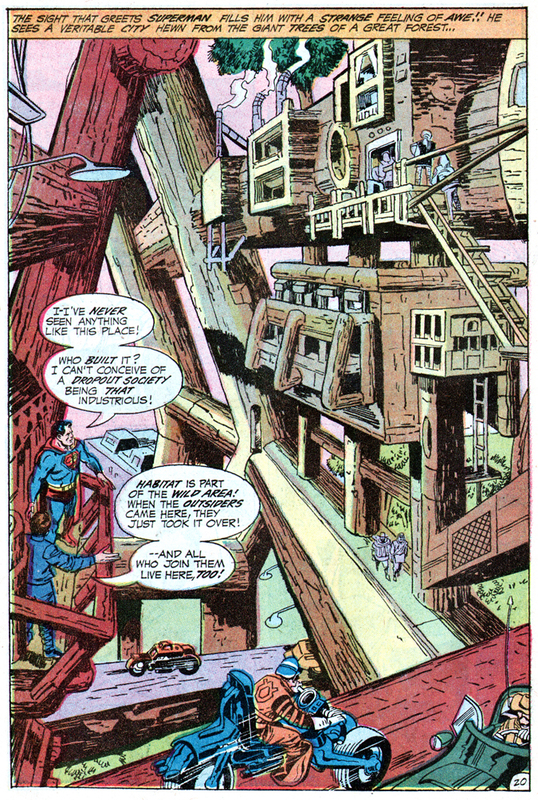 Of course, Habitat is a section of the Wild Area, adopted home to the “dropout society” called The Outsiders… But just who built the wooden city… and for what purpose? And what about these rumors of a monstrous “Mountain of Judgment”? After Supes recovers from being zapped with a Kryptonite Paralyzer Rod and wakes up in Habitat, we learn that Jimmy’s assignment is to find answers to the aforementioned questions. Day 10: Green K Paralysis Ray! Posted 11 October 2010 in Day Entries, Jimmy Olsen #133, Weapons & Devices. 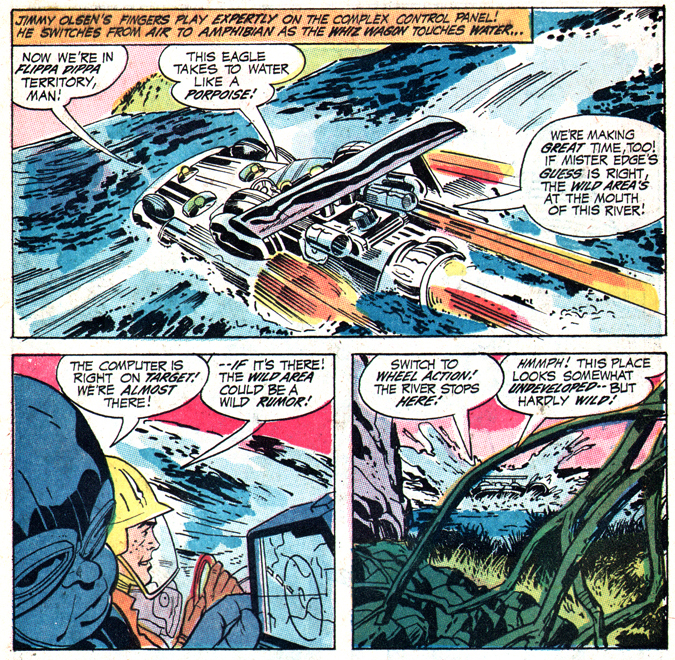 Trigger-happy Yango the Outsider zonks Supes not once, but twice, with the Hairie-built Green K Paralysis Ray Gun, in the first two issues of Kirby’s JO run. 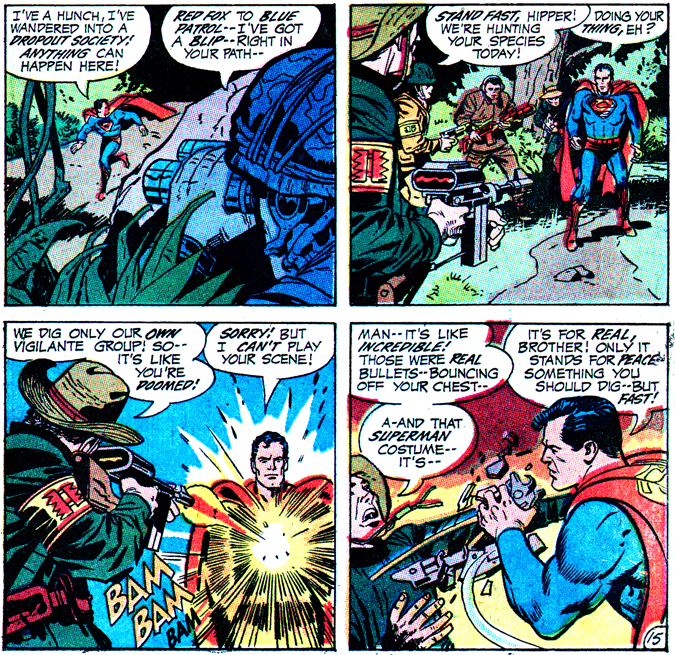 How fortuitous that it contain green Kryptonite, which is lethal to Superman (until the events of Jan. ’71’s Superman #233, natch)… But if the Man of Steel is familiar with The Project and a friend to the Hairies, why have they prepared a weapon to be used against him (or Supergirl, I presume)? Must be that Yango is just a mean person, eh? Posted 10 October 2010 in Day Entries, Earth, Jimmy Olsen #133, Supporting Characters. No, no, not the Oakland Raiders; the Wild Area Raiders, whom The Outsiders thought they were attacking when they ambushed Superman. I’ve always assumed these machine-gun toting interlopers were actually a military squad from The Project — note the “Red Fox to Blue Patrol” chatter — but mayhap they were well-armed scavengers in that dangerous environment? And, if scavengers, what were they scavenging or raiding? Habitat? I’m now thinking they were hoping to prey on The Project itself… Tell me what I’m not getting here, will ya? Be here tomorrow for: The Green K Paralysis Ray! Day Eight: The Wild Area Ascetic! Posted 9 October 2010 in Day Entries, Earth, Jimmy Olsen #133, Supporting Characters. The presence of high-tech gas-emitting defenses leads me to suspect the ascetic is a Hairie on leave from the Mountain of Judgment, but you guys tell me what you think? Do you feel the spirit, are you in the groove? Day Seven: Yango and Flek! Posted 8 October 2010 in Day Entries, Earth, Jimmy Olsen #133, Supporting Characters. 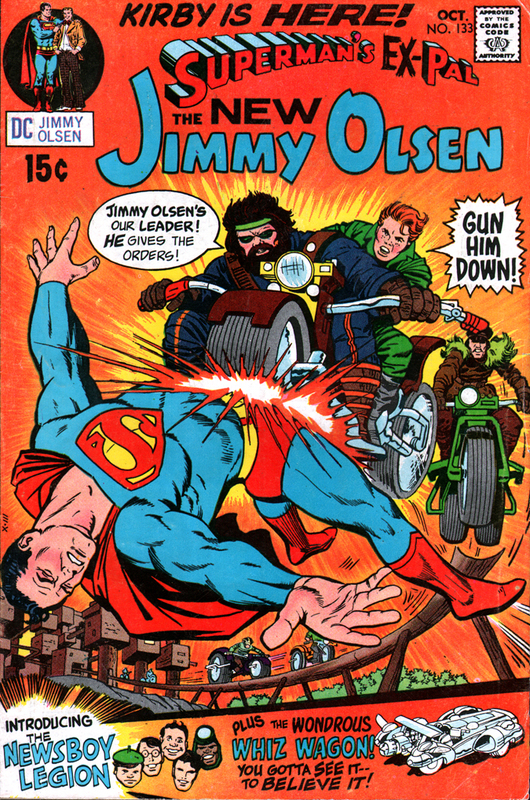 The cover models of JO #133, Yango (the bearded ruffian) and Flek (the more dandy dude) make a notable, if limited, appearance inside the issue, bestowing leadership status to the Daily Planet cub reporter of the biker gang, The Outsiders. Theirs is a ballsy outfit, as Yango, grim behind his sunglasses, even bests the Man of Steel with a Kryptonite ray-shooting gun (with Superman’s EX-Pal’s approval!). 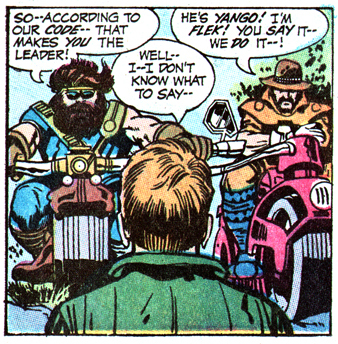 Yango, the most prominent biker in the series, would go on to display “unprecedented regard for his kind” and take over The Outsiders as head honcho (after former boss Jimmy O. abandons the outfit without so much as a fare-thee-well! 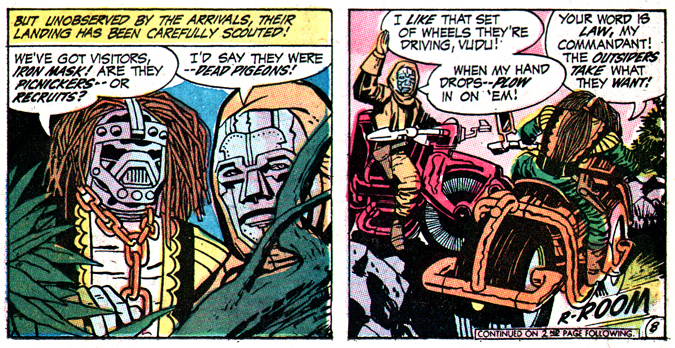 ), this during the onslaught of the Four-Armed Terror on Habitat in JO #137. In that same issue, Yango appears alongside a new Outsider, the heretofore unseen Gandy, who looks the spitting image of Flek. This resemblance begs the question whether Kirby, moving at lightspeed in unleashing new concepts and characters, simply forgot the gang member’s name and was too busy penciling 15 pages a week to check. Posted 7 October 2010 in Day Entries, Earth, Jimmy Olsen #133, Supporting Characters. 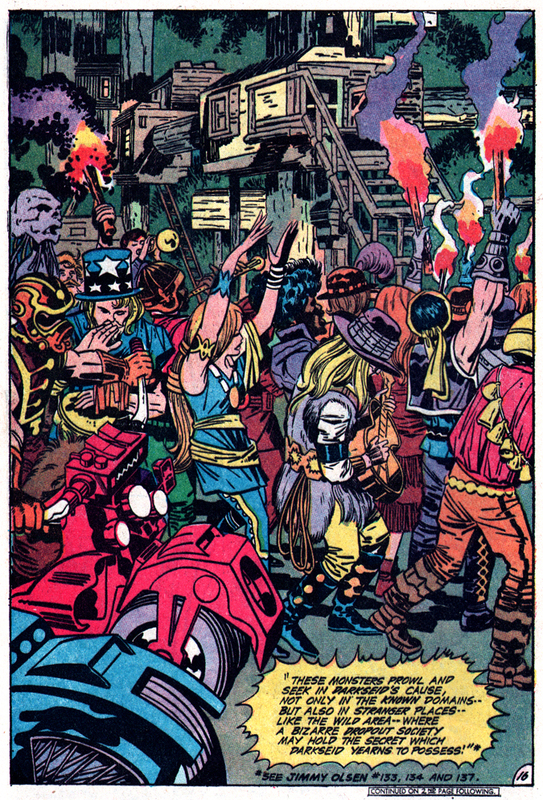 The Hell’s Angels Motorcycle Club of “The Wild Area” is composed of former leader Iron Mask and minions, including Vudu, Yango, Flek, and Gandy (who looks an awful like Flek in the opening sequence of JO #137), heading the “dropout society” which inhabits the tree city called “Habitat.” They rove on their futuristic three-wheeled motorized hogs over the Zoomway, looking for adventure and whatever comes their way (apparently). Jimmy O., after beating the tar out of Outside boss-man Iron Mask, temporarily becomes revered head man of the mobilized cadre. Overall, though, The Outsiders are more than just a biker gang: they are leaders and protectors of a huge forest commune of young people, hippies really (true nature’s children? ), who have taken over a vast wooden metropolis built and abandoned by The Hairies, whom we will learn more about quite soon. It’s interesting to note that his approach to the counter-culture was one of curiosity and not without sympathy. As to be seen in the days to come on this page, especially with the “Hairies,” one suspects this cigar-chomping, “deese ‘n’ doose” former East Side Kid, U.S. Army veteran of the Battle of the Bulge, felt a kinship with young people of the “Generation Gap” era, not necessarily a common empathy for those of his age. Day Five: Iron Mask and Vudu! Posted 6 October 2010 in Day Entries, Earth, Jimmy Olsen #133, Supporting Characters. Coming soon: Fellow Outsiders Yango and Flek!